Today my guest is Michael Tonsmeire. Michael is the author of the book Sour Beers (Amazon affiliate link) as well as the blog The Mad Fermentationist. Michael is an award winning brewer and BJCP judge, and is opening a new brewery called “Sapwood Cellars” in Columbia, MD this summer. We start with a brief discussion of Michael’s new brewery “Sapwood Cellars”. Michael explains the New England IPA style, which though not formally defined has recently become popular. We discuss the history of the style, which started only about 6 years ago. Michael tells us the key differences between the NE IPA and a typical West Coast IPA. We talk about the haze and how the cloudiness in the beer comes about. Michael shares his thoughts on the appropriate grain bill to use for this IPA. We discuss which hop varieties are appropriate for a New England IPA as well as hop schedules. We talk about why NE IPAs are oxygen sensitive. He gives us some advice on related styles as well as final tips on NE IPAs. 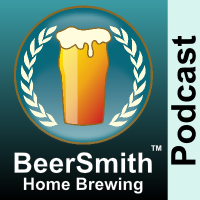 We discuss the upcoming launch of Michael’s new brewery called “Sapwood Cellars” opening in Columbia, MD this summer.